Is it just me, of have you also noticed farro popping up on all sorts of menus lately. Maybe it’s just a Seattle thing, but it seems that all the cool chef’s are doing it, much to my delight. I love the nubby little Italian grain, and have had it in savory dishes in at least three or four restaurants in the last month, usually cooked up as a risotto-like accompaniment to a hearty game meat, but on occasion, as the focal point of the dish. Most memorably was Madison Park Cafe chef Amanda Zimlich’s gorgeously rich Shiitake mushroom & farro risotto with wild onions, roasted root veggies and a sinful amount of Washington grown truffles. All these savory farro dishes left me satisfied, but also pondering a sweeter version. 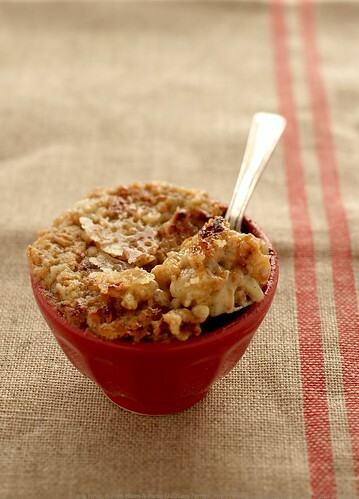 The grain holds up beautifully being slow cooked, releasing just the right amount of starch and getting soft but not mushy and maintains a full, nutty flavor… perfect for a whole-grain “rice” pudding. After searching through a whole stack of cookbooks in search of the perfect recipe to start from, I narrowed it down to The Sweet Life‘s Coconut-cardamon rice pudding and the Risotto Pudding BrÃ»lÃ©e in Donna Hay’s Entertaining. As tempting as the Zuckerman recipe sounded, I really had my head set on a strong vanilla scent. The coconut will have to wait for a different occasion. Substituting farro does require a bit of a change in cooking time. Unlike rice, farro takes much longer to soften and absorb the liquid being cooked in, so you’ll need to allot more time if you are substituting it in other recipes. Also, don’t expect the farro to break down to the silky smooth texture you’d get in a risotto. The farro berries will maintain more of their original shape, and keep a bit of a bite to them even when softened. I love the chew this imparts to the dishes, but if you like an almost-paste like rice pudding, you’ll probably do best to skip this recipe. As I whipped up the pudding, I decided that in addition to the brÃ»lÃ©e presentation, I’d also do something a bit simpler and a bit more lavish. For the simple, what could be better than the pudding, still warm with a few fresh blueberries tossed in for a bit of added sweetness? Not much in my book. 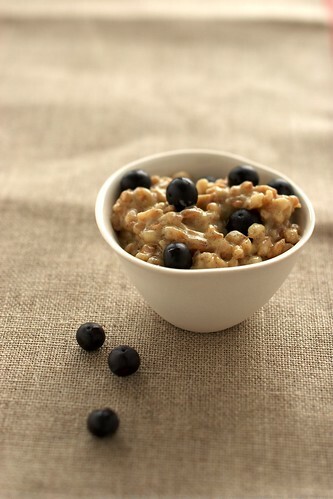 This is a perfect breakfast (if I ate breakfast) treat, warm and hearty with just the right hint of fruit and vanilla. The brÃ»lÃ©e was equally delicious. Not having a brÃ»lÃ©e iron made the whole process a bit tricky, as I faked it by holding the sugar coated pudding up about 2 cm from the broiler to crisp up the top. It worked, but the sugar really needs the direct heat to quickly caramelize it without heating up the underlying pudding, which tends to release a bit of oil. If you go this route, definitely use a kitchen torch or a brÃ»lÃ©e iron for best results. When you do, you’ll end up with a gorgeous golden brown crust to your creamy and chewy pudding. Finally, for a bit of show, I decided to make a chilled version that was formed with a mold, topped with some freshly sliced Page mandarins, and drizzled with a blood orange reduction. 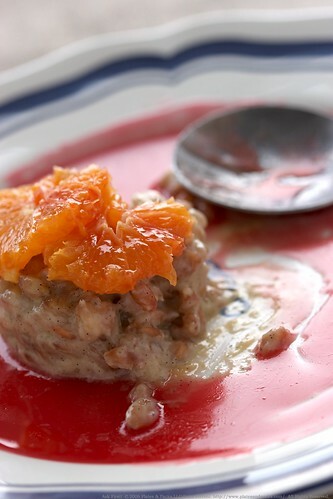 It looks impressive, with the bright orangey-red of the syrup, the bright orange of the mandarins and the vanilla flakes clearly making their presence known in the pudding, but it is simpler to throw together than you might think. And the flavor is brilliant. The sharp sweet citrus and the mellow nutty/vanilla of the pudding are a match made in heaven’s kitchen. Whisk the water and milk together, and bring to a low simmer in a heavy bottomed pot over medium heat. In a separate pot, heat the butter until just melted, then add the farro and cook for about 5 minutes. Add the vanilla beans, and stir. Then, start to pour the milk/water mixture into the farrow about a 1/2 cup at a time. Between additions, stir well until the liquid is absorbed. Repeat until all the milk/water mixture is well incorporated and absorbed. This will likely take about 30 to 40 minutes. Remove the vanilla beans, and add the sugar and vanilla extract. Whisk together the cream and egg yolks in a separate dish. Then, slowly add to the farro, stirring until it is well absorbed. The the texture of the mixture should be fairly thick and creamy with the farro grains still holding their shape but al dente. At this point, the pudding is ready to eat. To brÃ»lÃ©e, place the pudding in the dish to serve, and sprinkle with casters sugar. Torch the top, or run a hot brÃ»lÃ©e iron over the sugar until it melts and is golden. Allow to cool slightly before serving. If you want to serve with the syrup, combine the juice of two to four blood oranges and around 1/4 cup of sugar together and heat over moderate heat it starts to thicken slightly… it will thicken more as it cools. This entry was posted in Cookbooks, Desserts, Food, Recipe, Seattle Restaurants, Sweet. Bookmark the permalink. I must try this at Madison Park Cafe next month when we’re back in Seattle! I really like each one of your puddings!! I love farro and that *chew* you refer to, but haven’t cooked it too much. Thanks for the recipe ideas. I’ve been enjoying your blog. I’ve actually never had farro, but this looks really good! One of my favorite chefs makes a risotto of epeautre (which I am pretty sure is the French for farro) with some veal stock and showers it with truffles. Oneof the best things I have ever eaten. Never thought of using it in dessert, though. You’re right, it’s everywhere – I had a delicious beef cheek ravioli at Volterra last night, and the pasta was made with, I do believe, farro flour. Tanna – definitely a must visit. I was amazed at how it I had missed it for so long! Amanda, the chef, is amazing. Also, they are going to be at FareStart soon, so you might look for them there too! Tammy – Thanks! It’s become a recent obsession for me, but this is the first I had cooked it as well. Not much more difficult than cooking steel cut oats though, so you have nothing to worry about. 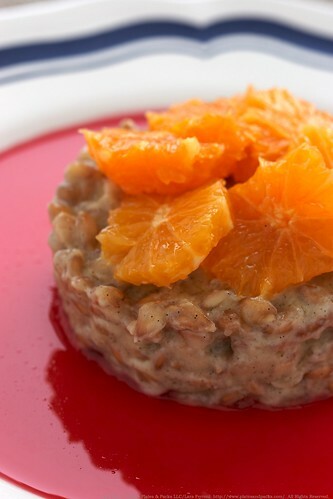 I’ve never thought of using farro for puddings, but yours look delicious. In Italy is very popular (especially in Tuscany) and I usually prepare it as a pasta salad, mixing it with tomatoes, onions, cheese and much more : ). To reduce cooking time (it doesn’t even need to be soaked) you should try to get ‘farro perlato’, which is the refined version of the grain. Yes, I have seen a lot of recipes for farro. I use it in savory dishes but will have to try it in a sweet one. Your delicious photos and write-up have convinced me. I’ll have to see where I can pick some up. I’d never had any before. I’ve gotten hooked on farro myself in the last year or two, and I suspect you’re right about it being a bit of a Seattle restaurant trend. I think it’s really just at a few places so far, but they’re fairly influential in their own right. Also, I suspect farro has recently become more widely available, or just better marketed than whole spelt berries. Dinner about a week ago was built on farro, shallots and some purple carrots. I haven’t done any sweet applications so far, but I have found that cooking it in a rice cooker makes preparation painless. I love farro too! I stock up on it everytime I go to Tuscany. Just tried a chocolate bar with farro in it too! Ales – I’ll have to keep my eye out for that. The farro-Tuscan salad sounds lovely. Thanks! Michelle – I got mine at Whole Foods, but it shouldn’t be too tricky to find in other places or to order online. Jason – I hadn’t thought about using the rice cooker, but that makes perfect sense. I’ll have to try that sometime. Thanks! Darn, I was really looking forward to making your sweet pudding tonight, only to not find any farro! I guess the trend has not made its way here as of yet. Do you think short grain brown rice would be an acceptable substitute? Not the same, I know, but I’m all ready for pudding now. Marianne – sure… in fact, the recipe I started from was a rice recipe, and I substituted out the rice for farro. You’ll end up with a very different texture of course, but should get a good flavor. Other substitutions I’d like to try are barley or even old fashioned steel cut oats like McCanns… just make sure you don’t use instant. one of the reader requested restaurant recipes (4Rs?) in this month’s Gourmet is one of my boyfriend’s favorite farro recipes of all time. it’s from a little joint here in NYC called ‘inoteca where they serve the farro for brunch topped with roasted fruit.